In the beginning, there was Pong. Glorious Pong, with its gargantuan cabinet and two shining wheels. Progenitor Pong, revered ancestor of all video games. Pong, perfect in its symmetry: two dimensions, two colors, two players. Thus began the primal story. I am Pong and you are Pong. We fight. From the fertile loins of Pong sprung limitless forms of video game competition. Pong was based on tennis, and we now have video game versions of every popular world sport, but Pong’s legacy does not stop there. That simple idea of two players, one screen, and competition spawned entire genres of gaming: Fighting games, racing games, and eventually even split-screen first-person shooters. Pong was pure competition based on a sport. Now competitive video games have become sports themselves. There are professional players of Starcraft, Street Fighter, and CounterStrike. There are joysticks and controllers designed with the professional gamer in mind. All hail Pong. Pong’s detractors will claim that it now seems rudimentary, even dull, but is it not simple enough to be understood by all? 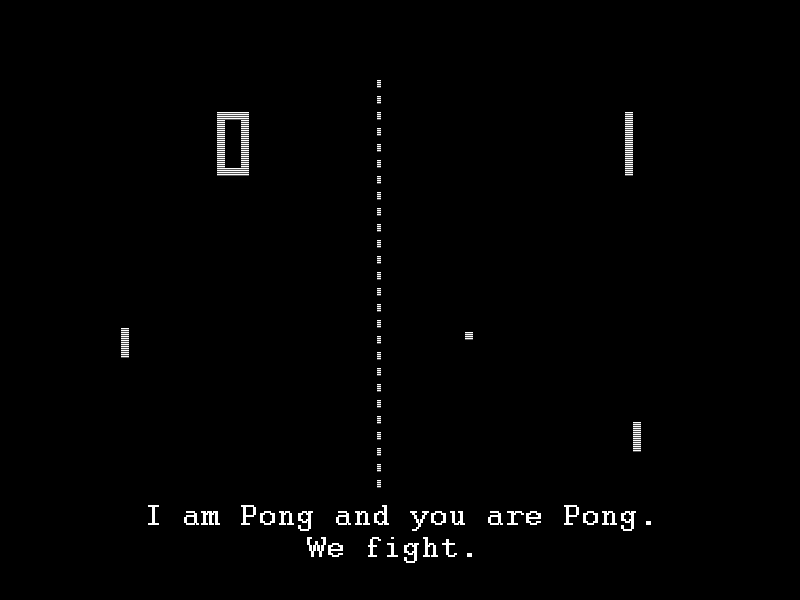 Pong speaks a universal language. It is the language of love and friendship, of two people having more fun together than they would apart. It is also the language of war, for those two are locked in endless combat. Some will say that Pong was not the first to enter the arcades and draw worship, and indeed, there were false prophets before the coming of Pong. What if Computer Space, the world’s first commercially sold coin-operated video game, had been the first to gain popularity? A spaceship fires rockets at flying saucers and avoids their fire. There are twin stick shooters even today, praying to the false god called Computer Space, but their popularity reflects their heretical beliefs. 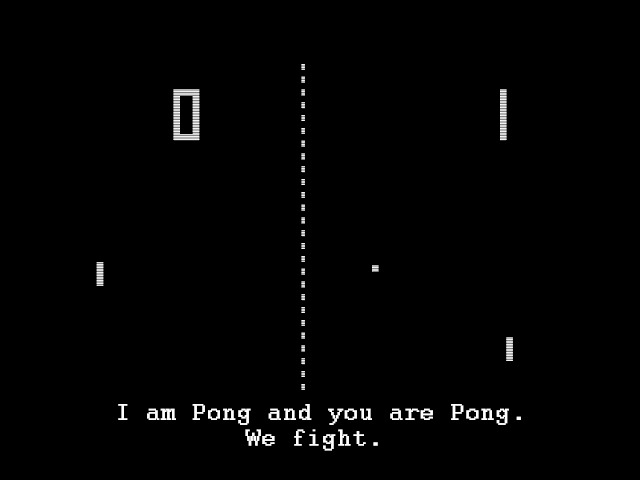 Pong’s glorious victory changed the face of entertainment. It showed that we can enjoy technology, friendship, and competition simultaneously. In the new world that Pong created, we care little for the high scores of strangers. We live in the moment. Our concerns are immediate: Can I snipe that space marine before he sees me? Do I have the resources to support my growing army? Can I pull off my ultra combo? Can I kill Pong before Pong kills me? Pong will never be forgotten. Eternal Pong, which made electronics fun. Blessed Pong, which taught us of digital victory and defeat. Primeval Pong, unassailable and absolute. Pong is pretty late to the game. Though your heretical views are historically based, verily you are blinded by facts and figures. Though the Great God Pong was not among the first to exist, it was the first to succeed commercially and capture the hearts and minds of humanity.